There are other ways how to create scripts dynamically. These scripts are compiled dynamically when needed (before executed for the first time). That's why they are considered dynamic and you don't have to see them in the Script location list (until compiled by the browser). 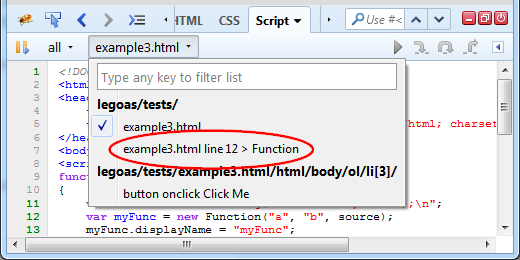 If you select the script from the script location menu, you should see the source that is placed within the onclick attribute. Of course, you can create a breakpoint as usual. 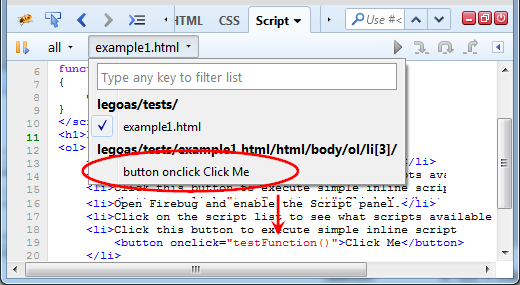 Try live example page if you have Firebug 2 installed. 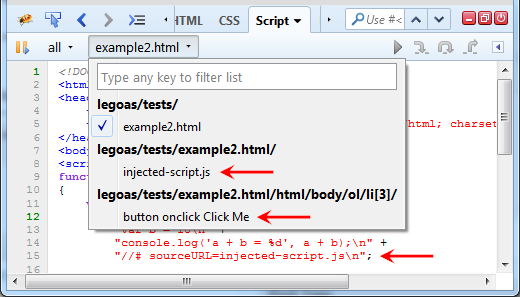 Another way how to dynamically compile a piece of script is using <script> element injection. Again, you can check out live example. There is one event handler script: button onclick Click Me since we injected the script through a button and its event handler. We want to switch into beta phase soon and it would be great to hear from you about how this version is working for you. The article says " ", but it should rather be " " to describe the general format. You say "You can't use displayURL due to a platform bug", but you actually mean "sourceURL". The article says "[element-name] [attribute-name] [button-label]", but it should rather be "[element-name] [attribute-name] [text-content]" to describe the general format. > but you actually mean "sourceURL". I kept button-label in there, I think it's more understandable what it means.